I've been looking for evidence of Earth generated ultra-sound seismic waves "sono-cracking" hydrocarbons. Not much is out there to indicate it. Though, there are a few experiments indicating that sono-cracking hydrocarbons can occur at near room temperature. cavities that enlarge and implode, creating tremendous heat. The sonochemistry of liquids depends mainly on physical effects of the quick heating and cooling caused by cavity implosion. For instance, when Peter Riesz and his colleagues at the National Cancer Institute irradiated water with ultrasound, they proved that the heat from cavity implosion decomposes water (H20) into extremely reactive hydrogen atoms (W) and hydroxl radicals (OH-). During the quick cooling phase, hydrogen atoms and hydroxl radicals recombine to form hydrogen peroxide (H202) and molecular hydrogen (H2). If other compounds are added to water irradiated with ultrasound, a wide range of secondary reactions can occur. Organic compounds are highly degraded in this environment, and inorganic compounds can be oxidized or reduced. Other organic liquids also yield interesting reactions when they are irradiated with ultrasound. For' example, alkanes, major components of crude oil, can be "cracked" into smaller, desirable Crude oil is normally cracked by heating the entire mixture to temperatures above 500 degrees C. irradiating alkanes with ultrasound, however, makes cracking possible at room temperature and produces acetylene, which cannot be produced through simple heating. Perhaps the most unusual chemical phenomenon associated with ultrasound is its ability to produce microscopic flames in cold liquids by a process known as sonoluminescence. When an imploding cavity creates a hot spot in various liquids, molecules may be excited into high-energy states. As these molecules return to their ground state, they emit visible light. Edward B. Flint in our laboratory discovered in 1987 that hydrocarbons irradiated with ultrasound provide a most striking result: emitted light similar in color to a flame from a gas stove. The effects of ultrasound on liquids have also been used to enhance the chemistry of compounds in solution. Compounds that contain metal-carbon bonds, called organometallics, are particularly illustrative. This diverse class of chemicals is important in the formation of plastics, in the production of microelectronics and in the synthesis of pharmaceuticals, herbicides and pesticides. In 1981 Paul F. Schubert and I first investigated the effects of ultrasound on organometallics, in particular iron pentacarbonyl, or Fe(CO)5 The results, when compared with the effects of light and heat on Fe(CO)5 underscore the distinctive chemistry that ultrasound can induce [see illustration on opposite page]. When Fe(CO)5 is exposed to heat, it decomposes into carbon monoxide (CO) and a fine iron powder, which ignites spontaneously in air. When Fe(CO)5 is exposed to ultraviolet light, it first breaks down into Fe(CO)5 and free CO fragments. Fe(CO)5 can then recombine to form Fe2(CO)g. Cavity implosion creates different results. It delivers enough heat to dissociate several CO molecules but cools quickly enough to quench the reaction before decomposition is complete. Thus when Fe(CO)5 is exposed to ultrasound, it yields the unusual cluster compound Fe3(CO)12. The sonochemistry of two immiscible liquids (such as oil and water) stems from the ability of ultrasound to emulsify liquids so that microscopic droplets of one liquid are suspended in the other. Ultrasonic compression and expansion stress liquid surfaces, overcoming the cohesive forces that hold a large droplet together. The droplet bursts into smaller ones, and eventually the liquids are emulsified. Emulsification can accelerate chemical reactions between immiscible liquids by greatly increasing their surface contact. A large contact area enhances crossover of molecules from one liquid to the other, an effect that can make some reactions proceed quickly. Emulsifying mercury with various liquids has particularly interesting chemistry as delineated by the investigations of Albert J. Fry of Wesleyan University. He developed the reactions of mercury with a variety of organobromide compounds as an intermediate in the formation of new carbon-carbon bonds. Such reactions are critical in the synthesis of complex organic compounds. The sonochemistry of solid surfaces in liquids depends on a change in the dynamics of cavity implosion. When cavitation occurs in a liquid near an extended solid surface, the cavity implosion differs substantially from the symmetrical, spherical implosion observed in liquid-only systems. The presence of the surface distorts the pressure from the ultrasound field so that a cavity implosion near a surface is markedly asymmetric. This generates a jet of liquid directed at the surface that moves at . speeds of roughly 400 kilometers per hour. The jet, as well as the shock waves from cavity implosion, erode solid surfaces, remove nonreactive coatings and fragment brittle powders. Reactions are further facilitated by high temperatures and pressures associated with cavity implosion near surfaces. These processes all enhance the chemical reactivity of solid surfaces, which is important in the synthesis of drugs, specialty chemicals and polymers. The sonochemistry of solid surfaces in liquids is best exemplified by reactions of active metals, such as lithium, magnesium, zinc and aluminum. Ultrasonic irradiation of reaction mixtures constituting these metals provides better control at lower temperatures and produces relatively higher yields. Pierre Renaud of the University of Paris first examined such reactions. More recently Jean-Louis Luche of the University of Grenoble and Philip Boudjouk of North Dakota State University have popularized the use of an ultrasonic cleaning bath to accelerate the reactions of active metals. The chemistry of these metals is very difficult to control. Traces of water, oxygen or nitrogen can react at the surface to form protective coatings. Increasing the reactivity of the protected surface by direct heating, however, can result in undesirable explosions. Ultrasound can keep the surface clean and allows the reaction to proceed evenly at reduced ambient temperatures. Excellent yields and improved reliability can be achieved for many reactive metals in large-scale industrial applications. Since ultrasound improves the reactivity of metal powders, it also makes them better catalysts. Many reactions require a catalyst in order to proceed at useful or even appreciable rates. Catalysts are not consumed by the reaction but instead speed the reaction of other substances. The effects of ultrasound on particle morphology, surface composition and catalyst reactivity have been investigated by Dominick. Casadonte and Stephen. Doktycz in our laboratory. They have discovered that catalysts such as nickel, copper and zinc powders irradiated with ultrasound show dramatic changes in surface morphology. Individual surfaces are smoothed and particles are consolidated into extended aggregates. An experiment to determine the surface composition of nickel revealed that its oxide coating was removed, greatly improving the reactivity of the nickel powder. Ultrasonic irradiation increased the effectiveness of nickel powder as a catalyst more than 1,000,000 times. The nickel powder is as reactive as some special catalysts currently in use, yet it is nonflammable and less expensive. HOUSTON — For decades, the giants of the oil industry were confounded by salt. While oil companies for years had shot sound waves into the deep to help create images of undersea geology, salt located far under the floor of the Gulf of Mexico was unpredictable. It muffled reflections, or bounced them away from survey vessels, leaving geophysicists in the dark. But that was before a series of recent seismic imaging breakthroughs involving supercomputers and the largest moving objects in the ocean. The advancements helped oil companies peek under salt layers located miles below the Gulf and have spurred a number of discoveries and billions of dollars in new investment in offshore oil production. "It’s like a medical imaging experiment that we’re all familiar with when they take an ultrasound and show us an image of the baby, only it’s done on a planetary scale," said Craig Beasley, chief geophysicist for Schlumberger’s WesternGeco subsidiary. Using the new and evolving methods, oil companies have found ways to shoot sound miles below the surface and capture more echoes of those sound waves than they ever have. Teams of mathematicians, geophysicists and software engineers use large computer systems to translate those echoes into three-dimensional images of reserves more than six miles below ocean, rock layers and salt, a feat that was little more than a dream a decade ago. The innovations have helped oil companies tap into some of the largest offshore oil reserves ever discovered and are a big reason why four towering oil platforms were under construction this summer at a single yard in Ingleside near Corpus Christi. The platforms are the culmination of multibillion dollar projects to extract oil from reservoirs that would have been challenging to target prior to seismic imaging advances. "If the seismic had stayed the same as it was in 1999 and 2000…today we would be effectively drilling in the dark," said John Etgen, BP’s distinguished adviser for seismic imaging. Beasley said salt previously created havoc in seismic images. "The easiest way to think about it is the swimming pool where you put your pole in the swimming pool, and it looks like there’s a kink in the pole," he said. The shape of the pole hasn’t changed, of course, but its image is distorted. Salt in underground layers as thick as 18,000 feet can have the same effect, sending sound waves back at different speeds and angles and leaving gaps in data and distorting images. Since salt reflects sound in a variety of directions, geophysicists had to find a way to capture more echoes. Covering the ocean surface with sensors isn’t practical, so experts at BP decided to experiment with additional sources of sound, Etgen said. Most seismic surveys involve boats towing arrays of cables up to five miles long and half a mile wide, perhaps creating the largest moving bodies in the sea. The cables are equipped with hydrophones, which measure sound in water. To generate sound waves, oil companies use air guns to create explosive sounds under water in intervals as long as 15 seconds. Environmentalists say the noise can endanger sea life. The air guns can produce underwater noise of more than 130 decibels, 10 miles from the source, said Michael Jasny, director of the Natural Resource Defense Council’s marine mammal protection project. That’s as loud as a jackhammer and almost as loud as the sound of a jet engine, which measures 140 decibels. A settlement earlier this year among environmentalists, regulators and a leading industry group puts some limits on air gun use. When they are used, each blast sends sound waves deep below the ocean and seafloor. Their echoes return and hit the hydrophones. BP in 2004 pioneered the wide azimuth towed streamer method, a new approach to seismic that would change the industry. The process captures more sound waves with the same set of cables by using multiple boats firing air guns, Etgen said. Each boat sends soundwaves into the ground, delivering reflections to the surface from multiple angles. Powerful computers use mathematical processes called algorithms to combine the echo images, creating a sharper view of what lies beneath the salt, Etgen said. The effect is similar to sports broadcasts that use multiple cameras to show the action from different angles. If one angle produces a distorted or incomplete image of the underground rocks, measurements of other reflection angles help fill in the missing parts. "The more of that thing that I can catch and record, the better chance I have of making an image," Etgen said. The wide azimuth survey produced 16 times as much data as conventional seismic surveys, he said. The success prompted other experiments. Beasley said WesternGeco championed an approach involving just one boat with an air gun and streamers attached. The guns fired as the vessel moved in a giant circle, with a radius of up to 5 miles. Then it moved over slightly and made another, overlapping circle. The method allowed a single array to encircle the reflections bouncing up from the subsurface, helping a survey vessel capture more sound waves from each air gun blast, Beasley said. WesternGeco now is advancing seismic imaging that involves multiple sounds being fired at the same time, cutting out the waiting period needed between air gun shots, Beasley said. Another revolutionary approach places sensor nodes on the ocean floor rather than towing them on the surface, said Roger Keyte, director of marketing and strategy for Sugar Land-based Fairfield Nodal. It produces the yellow, disk-shaped nodes in its Sugar Land facility, then ships them by the thousands to locations where they’re dropped off boats, sink to the ocean floor and listen for sound. They can produce the most detailed images possible because they don’t encounter ambient noise from moving through the water and can be placed in position to capture sonic reflections, he said. The technique, called on-bottom seismic, allows oil explorers to examine plays beneath existing structures like platforms and pipes, which isn’t possible for unwieldy vessels towing strings of hydrophones. BP first used the method in a commercial survey at its Atlantis field in 2005, Etgen said. Although they produce more data than towed hydrophones, on-bottom seismic surveys can cost as much as four times more, Fairfield Nodal’s Keyte said. But companies have found on-bottom seismic critical to expanding their drilling efforts. "I view it as a ground-breaking kind of technology that’s allowing us to see the subsurface like we’ve never seen it before," said John Hollowell, Shell’s executive vice president for deep water in the Americas, in a July interview. "And the success of these projects in many respects is your ability to see the subsurface better than anybody else." Several of the largest oil fields ever discovered were not produced until many years later, after advances that helped oil companies better plan for the deep obstacles they might face. BP’s Thunder Horse field, the second largest field discovered in the Gulf with an estimated 1.1 billion barrels of oil equivalent in recoverable reserves, was discovered in 1999, but production didn’t begin until 2008, according to research from energy consulting firm Wood Mackenzie. Shell’s Mars-Ursa field, which was discovered in 1989, is the largest in the Gulf of Mexico, with 1.3 billion barrels of oil equivalent in recoverable reserves, according to Wood Mackenzie. Production didn’t begin at the Mars field until 1996. Reserve estimates for both fields, and others, have increased as seismic imaging advancements have helped companies better understand underground rock layers. And a new effort to produce oil from the Mars field is currently underway, following advancements in seismic imaging that helped Shell drill new wells there. Advancements since then have led to a rush of huge new Gulf discoveries, some that have lifted the profile of smaller oil companies, such as Cobalt International Energy. Cobalt explicitly targets reserves located below salt layers, focusing on its use of advanced seismic imaging to help it find oil, the company says. Cobalt made one of the largest gulf discoveries in the last decade when it found the North Platte field last year. The field holds 500 million barrels of oil equivalent in recoverable reserves, according to Wood Mackenzie. Beasley said that further seismic advances are likely to help oil companies find more oil that they couldn’t see before. "I’m sure there’s a limit somewhere," he said. "We haven’t reached it yet." Outcrop of Monterey Formation, Gaviota State Park, California. The Monterey Formation is an extensive Miocene oil-rich geological sedimentary formation in California, with outcrops of the formation in parts of the California Coast Ranges, Peninsular Ranges, and on some of California's off-shore islands. The formation is the major source-rock for California's oil resources, and has had its strata extensively investigated and mapped for petroleum potential, and is of major importance for understanding the complex geological history of California. Its rocks are mostly highly siliceous strata that vary greatly in composition, stratigraphy, and tectono-stratigraphic history. The Monterey Formation strata vary. Its lower Miocene members show indications of weak coastal upwelling, with fossil assemblages and calcareous-siliceous rocks formed from diatoms and coccolithophorids. Its middle and upper Miocene upwelling-rich assemblages, and its unique highly siliceous rocks from diatom-rich plankton, became diatomites, porcelainites, and banded cherts. The Monterey formation has long been recognized as the primary source of the oil produced from other formations in Southern California; the Monterey itself has been very productive where it is naturally fractured. Since 2011, the possibility that hydraulic fracturing might make the Monterey Shale productive over large areas has gained widespread public attention. According to the US Energy Information Administration (EIA) in 2011, the 1,750 square mile Monterey Shale Formation contained more than half of the United States’s total estimated technically recoverable shale oil (tight oil contained in shale, as distinct from oil shale) resource, about 15.4 billion barrels. In 2012, the EIA revised its recoverable volume downward, to 13.7 billion barrels. As of 2013 advances in hydraulic fracturing commonly called "fracking," and the high price of oil resulted in spirited bidding by oil companies for leases. Occidental Petroleum and Venoco were reported to have been major players. The deposit lies 6,000 and 15,000 feet below the surface. A widely cited March 2013 study released by the University of Southern California (USC) estimated that if extensive resource-play development of the Monterey through hydraulic fracturing were successful, it could generate as many as 2.8 million jobs and as much as $24.6 billion in state and local taxes. However, observers have pointed out that as of 2012, however large its theoretical potential, no one as yet has succeeded in making the Monterey Shale widely economic through hydraulic fracturing; to date it has been economic only in those limited locations already naturally fractured. J. David Hughes, a Canadian geoscientist and Fellow of Post Carbon Institute, published a report in December 2013 analyzing the assumptions behind the EIA's forecast of Monterey tight oil production and the USC's forecast of resulting job and tax revenue growth. He found the EIA report's assumptions on prospective well productivity to be "extremely optimistic," and the total estimate of 15.4 billion barrels of recoverable oil "highly overstated." He also found the USC study's assumption that development of the Monterey shale could increase California oil production as much as seven-fold to be "unfounded," and the economic projections regarding jobs and tax revenue to be "extremely suspect." The Monterey Formation is considered the source of 84% of the oil in known fields of the San Joaquin Basin, a total of 12.2 billion barrels of oil. Of this, 112 million barrels of oil in known fields is produced from the Monterey itself. Monterey Formation oil was discovered at the Orcutt Oil Field in the Santa Maria Basin of Santa Barbara County in 1901. This was quickly followed by other Monterey discoveries nearby, including the Cat Canyon Oil Field and Lompoc Oil Field. Each of these early Monterey discoveries depended on natural fractures in the Monterey. The Monterey Formation is one of the reservoirs in the Elk Hills Oil Field of Kern County. The North Shafter and Rose oil fields of Kern County, which produce primarily from the Monterey Formation, were discovered in 1983, but attempts to produce the oil have not been highly economic. Some horizontal wells were drilled in the Rose field in the early 2000s, with 2,500-foot lateral lengths and single-stage open-hole fracs; the results were said to be improvements over vertical wells. Roughly four out of every 10 clusters of fractures in an average horizontal well are duds, Mo Cordes, vice president of integration at Schlumberger Ltd. said. “We've got to be able to do better,” said Cordes, who leads a similar effort to integrate experts at Schlumberger. "Everybody's really starting to realize you have to work together." The geologists are helping engineers better understand the layer-cake of rocks underground so they can guide their wells into the sweet spots and fracture the shale more effectively. Technology such as fiber-optic lines and 3D seismic imaging are helping scientists see and hear what's going on two miles underground. Geologists are also helping engineers understand the value of letting rocks "rest" after the brutal pounding of fracking, allowing more oil and gas to seep into the new cracks before pumping begins. Before the hunger for more science and technology, the industry was essentially drilling wells blindly, said Peter Duncan, a former geophysicist at Royal Dutch Shell Plc who founded Microseismic Inc. Operators originally viewed shale rock in the "layer cake" model, thinking all of the rock was the same. Real-world experience showed that's not the case, he said. Last year Exxon Mobil Corp.'s Chief Executive Officer Rex Tillerson promised to devote the company's massive research and technology capabilities to understanding shale reservoirs better than anyone else. "We can't take forever, but we can be deliberate about it," Tillerson told investors March 6. Commingling the expertise of their scientists through a software program Schlumberger calls "U-ROC" has led to an almost 30 percent increase in production in some wells in the Eagle Ford, Cordes said. Halliburton believes it can match or exceed that improvement with Cypher, its similar package of technology and software, said Stephen Ingram, Halliburton's technology and marketing manager for North America. The system, which has been used so far on hundreds of wells, can tell a producer exactly where to drill and the best way to frack for maximum production. They’re starting to figure it out. Laredo Petroleum Inc. shares doubled in the five months after it talked on a call with investors in May about working with Halliburton on well-spacing and by using a "science-based approach" in West Texas' Permian basin. By August, Laredo said it had its best-ever results in the Permian and that it was "among the best" of all peers working there. The well's success was attributed partly to Laredo's own internal efforts to pump more time and money into the science of drilling and production, said Ron Hagood, a spokesman at Laredo. Ultimately, Dave Dunlap, chief executive officer at Superior Energy Services Inc., said he doesn't ever see the decline curve challenge going away entirely. "We've drilled all the good stuff," he said. "These are very poor quality formations that I don't believe God intended for us to produce from the source rock." in my Opinion a new balanced theory is required that can be helpful in future exploration. both the theories has strong evidences and all the strong evidences should be respected to form new balanced theory. putting strong evidences of both together we can easily conclude that majority commercial oil has been expelled from those sedimentary rocks that essentially has been formed with the involvement of abiotic hydrocarbons ( once huge present on the surface of the earth in past geological time,like currently present on the surface of the Titan). sediment that has been formed with the involvement of these abiotic hydrocarbons are not suitable to form commercial interesting accumulations. ( only possible model that can respect the all valid evidences of both the theories). Conclusive Comment; Followers of abiotic theory can never be listened until they do not reconcile the strong evidence of association of MAJORITY global commercial oils with sedimentary rocks. No body is allowed to ignore this well tested past experience . This is the most strong point of biotic theory and most of the drillers are using this method and must be reconciled in abiotic theory otherwise nobody will listen . Expulsion of hydrocarbons from sedimentary source rock do not prove the biotic origin of petroleum. Yes, i agreed pre mind set up is a big problem as we have grown up by reading biotic theory from school time. In my opinion we required a balanced theory that can increase the future exploration efficiency. Iceland has a few interesting finds on PAH and lava. The content of PAH in modern and ancient sedimentary deposits was studied in marine, lagoon and lake deposits in areas in the north (Tjörnes, Skjálfandi, Öxarfjördur), west (Snaefellsnes) and southern (Svinafell) parts of Iceland. An association of smectite-zeolite secondary minerals characterises the Pliocene-Pleistocene sedimentary deposits in all the studied regions. Zeolites are represented mainly by chabazite that points to a rather low temperature during the hydrothermal alteration (Kristmannsdottir, 1982). In modern marine fine-grained sandstone and aleurolite in the Skjálfandi bay secondary minerals consist of smectite only. In lagoon sand collected at surface in a geothermal field of Öxarfjördur there were only found amorphous silica and Fe-hydroxides in present-day hydrothermal mineral precipitates. Hydrocarbons in the analysed deposits show a wide range in both content and composition. In the northern part of the rift zone total PAH values from 9 to 2635 ppb were measured in the surface lagoon sediments of the Öxarfjördur geothermal field. At the same geothermal field total PAH values of the Pleistocene marine deposits (well 4, 10 cores analysed from 333 to 437 m depth) range from 39 to 309 ppb. Pliocene and Pleistocene marine deposits sampled out of the rift zone showed a rather low content of PAH (Table 2, 3).Board coal, 7250 – Lignite, 7260 – Lignite; (*) index of refraction. Values of total PAH obtained in the modern Skjálfandi marine sediments scatter from 9 to 200 ppb (Table 4). Comparison shows that hydrothermally altered marine deposits at the Tjörnes, Breiðavik, and Búlandshöfði (Snaefellsnes) localities, with exception of the ones containing carbonificated plant remnants show only those species of PAH that were fixed in unaltered lava, tephra and hyaloclastite. In hydrothermally altered deposits carbonised plant remains worked as a geochemical barrier for concentration of secondary minerals and PAH species. Those data on PAH composition have produced a convincing evidence for the existence of modern natural gas emissions of hydrocarbons, including PAH, that rise to the surface up from the deep levels of the Earth crust. One may assume that at a certain depth there is a big fluidal source containing high-molecular hydrocarbons. Hydrocarbons are brought up to the surface together with the waters from the boreholes or natural springs, and with gas emission. The study of the distribution of polycyclic aromatic hydrocarbons in geothermal fields strongly indicates a close association with the dynamics of the modern hydrothermal environment. Hydrocarbons, coming up to the surface together with the hot fluids and gas from the heated foci in the earth crust are mostly emitted to the atmosphere. A certain part of this hydrocarbon flow as coming closer to the ground surface at lower temperatures seems to accumulate in the altered rocks together with secondary minerals. There are good reasons to assume that it is due to the long-term hydrothermal effect that secondary mineral assemblages may become substantially enriched in hydrocarbons. Such an environment could thus produce and accumulate isolated occurrences of bitumen substances. The total PAH content and composition differ significantly between various geothermal fields and samples collected at the same locality. Sediments of different mineral composition and intensity of hydrothermal alteration have a high diversity in content and composition of PAH. No correlation was detected between the genesis of deposits, hydrothermal mineral assemblages and PAH composition. One can suggest that the total PAH concentration as well as the composition in different secondary mineral assemblages would be expected to reflect the conditions of mineral formation – paleotemperature of groundwater, masflow circulation intensity, and the succession of the hydrothermal events. There has been discovered a great difference in PAH composition in groundwater sampled from different tectonic structures. It is very important to note that at the same location (e.g. Helgavogur in Myvatn and Kisilhóll fumarole field in Reykjanes) PAH composition in water and minerals or sediment precipitates differs significantly. It suggests a great fluctuation of PAH compounds in groundwater and a fluctuating accumulation of PAH within secondary minerals or fine grained sediments. A long-term study of hydrocarbon accumulation from steam and hot effluent water is needed to explain the nature of irregular trapping of hydrocarbons in secondary mineral assemblages and hydrothermally altered rocks. The correlation of PAH composition with geological and geothermal structures has been demonstrated by the study of soils. In Skógalón the PAH composition in soils from cold flanks of the geothermal field differs significantly from those revealed in warm and hot zones of the field (Figure 1). A clear correlation of PAH composition with rift faulting is disclosed in Reykjanes by studying soil samples collected along a profile extending from volcano Skálafell to Kisilhóll fumarole field across some active faults (Figure 2). These data as well as the accumulation of PAH from gas upflow jets by traps demonstrate the main pathways of hydrocarbon transportation from the deep levels of the Earth crust. water-power is in Germany only in its infancy. —for the chemical industry, for example. I will be highly appreciated if some one provide me any scientific paper showing that kerogen has been formed from deceased organic matter ONLY. Or deceased organic matter is precursor of kerogen . this will be a great help for me. But this is not deterring Beijing. While Chinese SOEs have been in the area for over a decade (CNPC began exploring in 1995), there is a new push to see the region developed. Beijing is reviewing a proposal for a new “deep-earth” exploration project that was submitted by some of China’s most prominent geologists. As the name would imply, the project involves drilling more than 10 kilometers into the Plateau in order to obtain samples for study. Even if the samples are promising, development of these resources is going to be technically challenging and China does not have a good track record in this area—it has had difficulty tapping its vast shale gas deposits without the help of Western IOCs. One point of concern that has been raised is the potential for water contamination. The Plateau is also known as the “water tower of Asia,” feeding many of the regions critical rivers as well as holding 30 percent of China’s freshwater resources. Develop these resources incorrectly, and it could negatively impact hundreds of millions, if not billions, of people. The Tibetan Plateau may be a mountain of money, but it’s too early to tell. Geological uncertainty, technical difficulty, water vulnerability, and politics all complicate production prospects. As Beijing chases self-sufficiency, we can only hope that they don’t cut corners. The Bergius Process is a method of production of liquid hydrocarbons for use as synthetic fuel by hydrogenation of high-volatile bituminous coal at high temperature and pressure. It was first developed by Friedrich Bergius in 1913, in 1931 Bergius was awarded the Nobel Prize in Chemistry for his development of high pressure chemistry. The coal is finely ground and dried in a stream of hot gas. The dry product is mixed with heavy oil recycled from the process. Catalyst is typically added to the mixture. A number of catalysts have been developed over the years, including tungsten or molybdenum sulfides, tin or nickel oleate, and others. Alternatively, iron sulphides present in the coal may have sufficient catalytic activity for the process, which was the original Bergius process. The immediate product from the reactor must be stabilized by passing it over a conventional hydrotreating catalyst. The product stream is high in naphthenes and aromatics, low in paraffins and very low in olefins. The different fractions can be passed to further processing (cracking, reforming) to output synthetic fuel of desirable quality. If passed through a process such as Platforming, most of the naphthenes are converted to aromatics and the recovered hydrogen recycled to the process. The liquid product from Platforming will contain over 75% aromatics and has a RON of over 105. Overall, about 97% of input carbon fed directly to the process can be converted into synthetic fuel. However, any carbon used in generating hydrogen will be lost as carbon dioxide, so reducing the overall carbon efficiency of the process. There is a residue of unreactive tarry compounds mixed with ash from the coal and catalyst. To minimise the loss of carbon in the residue stream, it is necessary to have a low-ash feed. Typically the coal should be <10% ash by weight. The hydrogen required for the process can be also produced from coal or the residue by steam reforming. A typical hydrogen demand is ~8 kg hydrogen per ton of dry, ash-free coal. Friedrich Bergius developed the process during his habilitation. A techniques for the high-pressure and high-temperature chemistry of carbon-containing substrates yielded in a patent in 1913. In this process liquid hydrocarbons used as synthetic fuel are produced by hydrogenation of lignite (brown coal). He developed the process well before the commonly-known Fischer-Tropsch process. Karl Goldschmidt invited him to built an industrial plant at his factory the Th. Goldschmidt AG (now known as Evonik Industries) in 1914. The production began only in 1919, after the World War I ended, when the need for fuel was already declining. The technical problems, inflation and the constant criticism of Franz Joseph Emil Fischer, which changed to support after a personal demonstration of the process, made the progress slow and Bergius sold his patent to BASF, where Carl Bosch worked on it. Before World War II several plants where built with an annual capacity of 4 million tons of synthetic fuel. These plants were extensively used during World War II to supply Germany with fuel and lubricants. BEIJING - To avert potential risks, China has raised the capital threshold for projects converting coal to liquid (CTL) fuel to brake a possible overheating in the coal-chemical industry, as excessive investment in such projects pollutes the environment and strains the water supply. In early July, the National Development and Reform Commission (NDRC), China's top economic-planning body and industrial watchdog, issued a circular demanding that local governments tighten control of new CTL projects before the national CTL development program is complete. The government will not approve coal-liquefaction projects with an annual production capacity under 3 million tons, according to the NDRC circular. One ton of coal-to-oil-processing capacity requires an investment of 10,000 yuan (US$1,250). Thus the 3-million-ton annual capacity means an investment of 30 billion yuan, an astronomical figure for most enterprises, said Li Dadong, an academician with the Chinese Academy of Engineering. "The move aims to contain possible overheating and ensure a healthy development of the coal-liquefaction industry across the country," he said. The world's largest coal producer, China generates about 70% of its energy needs by burning coal. Constantly rising oil prices have prompted the coal-chemical industry to try to find alternatives for petroleum in China, the world's fourth-largest economy. Oil-price hikes have further spurred a wave of new CTL projects. Coal liquefaction is a process that converts coal from a solid state into liquid fuels, usually to provide substitutes for petroleum products. Coal-liquefaction processes were first developed in the early part of the 20th century but later application was hindered by the relatively low price and wide availability of crude oil and natural gas. Large-scale applications have existed in only a few countries, such as Germany during World War II and South Africa since the 1960s. The oil crises of the 1970s and the threat of depletion of conventional oil supplies sparked a renewed interest in the production of oil substitutes from coal during the 1980s. However, the wide availability of inexpensive oil and natural-gas supplies in the 1990s in effect ended the near-term commercial prospects of these technologies. CTL fuel technology is still in an experimental phase in China, according to the NDRC. China is the world's second-largest energy producer and fifth-largest crude-oil producer. Driven by high oil prices and fast economic growth rates, China reached a record high in domestic oil production and consumption in the first half of 2006. In the first six months, China's domestic production of crude oil totaled 92 million tons, up 2.1% year-on-year. Domestic production of refined oil reached 85 million tons, up 5.6%, according to China Petroleum and Chemical Industry Association statistics. In that same period, China's net crude-oil imports reached 70 million tons, up 17.6%, and China's net import of oil products reached 12 million tons, up 48%, according to customs figures. Ministry of Commerce sources said China's oil imports accounted for 47% its total consumption in the first half of this year. And the latest figures from the NDRC show China imported 95.8 million tons of crude oil in the first eight months of this year, up 15.3% from a year ago. "China will continue to rely mainly on domestic energy supplies, and its oil production will stay anywhere between 180 [million] and 200 million tons a year for a relatively long period of time," said Zhang Guobao, vice minister in charge of the NDRC. The country will meet the energy challenge through stabilizing domestic oil output, looking for better energy alternatives and enhancing energy efficiency, according to a plan for the mid- and long-term development of the Chinese energy sector. "The coal-liquefaction project will offer an efficient way to quench China's thirst for oil. It is conducive to reducing China's external dependence on crude oil," said Professor Lin Boqiang of Xiamen University in eastern China's Fujian province. China began developing CTL technologies in the 1980s. The coal-liquefaction project was given strategic significance in the mid-1990s, as China became a net oil importer, according to Zhang Yuzhuo, deputy general manager of Shenhua Group, China's biggest coal producer. In 1999, China launched its first CTL project at Pingdingshan in Henan province. However, the project, with a 500,000-ton annual capacity, came to an untimely end because the type of coal it used proved unfit for liquefaction. In 2001, a high-tech research project under the national 863 Program picked up the pace on CTL projects. Shenhua Group took the lead in the process. In August 2004, it embarked on an ambitious direct coal-liquefaction project, the first of its kind in the world, at Ordos in Inner Mongolia. The project is designed to have an annual capacity of 5 million tons. Estimated to cost 24.5 billion yuan ($3 billion), the project will be undertaken in two phases. The first phase, designed to produce 3.2 million tons of oil products, is scheduled for production by 2007, the second phase by 2010, with a designed annual production capacity of 2.8 million tons. Other major coal producers followed suit. Last February, a coal-liquefaction project with a designed initial annual capacity of 160,000 tons was kicked off by the Lu'an Group in Tunliu, Shanxi province. Two months later, Yankuang Group initiated a huge two-phase coal-liquefaction project at Yulin in Shaanxi province that will involve a total investment of 100 billion yuan. The project is expected to yield 10 million tons of oil products a year by 2020. However, in addition to the three projects that have won approval from the NDRC, many other provinces and regions have blindly planned and built coal-liquefaction projects in recent years. The businesses look forward to significant economic returns counting the high price of oil and the current low cost of coal, despite potentially overloading local resources and ecosystem. The result: a headlong rush into CTL projects. It is reported that a total of 30 coal-liquefaction projects are under detailed planning or at the feasibility stage. According to conservative estimates, the total capacity would exceed 16 million tons, and the involved investment would surpass 120 billion yuan ($15 billion). Insiders predict that China's annual oil output liquefied from coal will reach 50 million tons by 2020. China has raised the capital threshold for projects converting coal to liquid fuel to prevent a possible overheating of the coal-chemical industry, as the excessive development of fossil fuels pollutes the environment and strains water supplies. On July 7, the National Development and Reform Commission (NDRC), China's top economic policy-making body, issued a circular requiring local governments to tighten controls over new coal liquefaction projects before the completion of the national development program for the coal liquefaction industry. The government will not approve coal liquefaction projects with an annual production capacity under three million tons, said the NDRC circular. One ton of coal-to-oil processing capacity needs an investment of 10,000 yuan (US$1,250). Therefore, an annual capacity of three million tons requires an investment of 30 billion yuan (US$3.75 billion), an astronomical figure for most enterprises, said Li Dadong, an academic from the Chinese Academy of Engineering. Constantly rising international oil prices have prompted the coal chemical industry to try to find alternatives to petroleum in China. Oil's recent rally towards US$80 a barrel has spurred a further wave of coal liquefaction projects. The demand for power in the Vaal Triangle increased such that a further three coal fired power stations were built on or next to coalfields. These were the Vaal Power Station built in 1945, the Taaibos Power Station built in 1954, and the Highveld Power Station in 1959. There were now five coal-fired power stations in the Vaal Triangle area, producing the greatest concentration of power generating stations in South Africa. It was in the 1980’s that Lethabo station came on line. It is a coal-burning power station, with the generating sets being able to consume approximately 40 000 tons of coal per day at full load, whilst at the same time producing close to 16 000 tons of ash. Lethabo holds the distinction of being the only power station in the world capable of burning a low grade coal. The coal, which has a calorific value generally in the range of 15 to 16 MJ/kg, is supplied from the Anglo Coal’s nearby New Vaal Colliery. The unusually low quality of the coal means that it also has a very high ash content of up to 42%. In keeping with national environmental legislation, electrostatic precipitators, the largest of their kind in the world, have been installed at Lethabo. The precipitators remove 99.8% of the fly ash present in the gases that are released through the smokestacks. The cement industry uses the ash as a cement extender, thus reducing the water demand of a concrete mix. Almost 250 000 tons of ash from the Lethabo Power Station was exported to Lesotho for the Katse Dam project. Electricity and steam generating plant was not the only use for coal. There was considerable interest in coal chemistry during the 1920s, and in 1927 a Government White Paper was published recommending the development of gasification and carbonisation processes. In the early 1930s, Anglovaal and the British Burmah Company mined oil shales near Ermelo, to distil off and refine the oil, mainly for petrol. Anglovaal’s interests in oil-from-coal were extended when rights to the German Fischer-Tropsch process were acquired and Etienne Rousseau, a research engineer, was appointed to investigate the production of synthesis gas from coal using the Fischer-Tropsch process. In September 1950, of the Government-sponsored South African Coal, Oil and Gas Corporation Ltd. (SASOL from the name South African Synthetic Oil Limited) was established and in 1955 Sasol produced its first oil from coal. The Sasol plant, later named Sasol One and now Sasol Chemical Industries (SCI), has been supplied with coal from the Sigma underground mine (consisting of the Sigma/Mohlolo underground and the Wonderwater strip-mining operations) since the early 1950’s. The mine is owned by the Sasol Mining division which in total produced over 51 million ton of coal in 2001 of which 6 million ton was produced at the Sigma Colliery. A lot of "Fischer-Tropsch" may naturally occur in long running coal-seam fires(?). Imagine if the world’s most abundant fossil fuel could be tapped without moving mountains, delivered without trucks or trains, and burned without emitting greenhouse gases. Actually, the technology to make this possible has been around for more than a century. Underground coal gasification (UCG) was pioneered by Sir William Siemens in the 1860s to light the streets of London. Vladimir Lenin hailed the method in a 1913 article in Pravda for its potential to rescue Russian workers from the hazards of underground mines. The technology works like this: Underground coal seams are ignited, and the resulting combustible gas is piped out for use in electricity generation or as a raw material in chemical production. The burn can be controlled by regulating the flow of oxygen, so there’s slim chance of giving rise to another Centralia. In that abandoned Pennsylvania town, a coal seam near the surface has been burning since 1962. The method also leaves the worst parts of coal—the mercury, arsenic, and lead—stored underground. And it allows for a much simpler capture of greenhouse gases—which can be piped back into the seam and stored there or sold to oil producers who inject it into wells to boost recovery rates. Development of coal gas is proceeding faster in places where natural gas is expensive and coal seams are deep, including Canada, South Africa, China, New Zealand, and Uzbekistan. Both of those preconditions are absent in the U.S.—at least right now. Hydraulic fracturing has depressed the price of gas to a 10-year low of less than $2 per million British thermal units. That’s well below the $6 per MMBtu that can be attained through a typical gasification project, according to estimates by Julio Friedmann, chief energy technologist at the Lawrence Livermore National Laboratory in California. “Cheap gas is the mortal enemy,” Friedmann says. That hasn’t stopped mining companies in the U.S. from picking up reserves that would otherwise be worthless. Peabody Energy (BTU), the largest U.S. coal producer, last year paid $6.5 million for 29 coal leases in Wyoming containing what it says are “billions of tons” of the fuel. The seams are too deep to mine conventionally but could be ideal for underground gasification. There is no doubt that abiotic theory is a real challenge to current biotic theory. there should be a Ph.d in abiotic theory also. sureshbansal342 wrote: There is no doubt that abiotic theory is a real challenge to current biotic theory. there should be a Ph.d in abiotic theory also. We might want to know what this is, its going to affect your electricity rates. Ultra supercritical (USC) steam generation is a derivation on the definitions of the temperature and pressure at which water vapor and liquid water are indistinguishable, aka the “Critical Point.” At that critical point of water some 705 degrees F/3208 psi, the bubbles of boiling disappears and the adding of heat or pressure to the basic water pushes a transition from water like to steam like characteristics. Pressure in a steam boiler is said to be “supercritical” when the pressure exceeds 3208 psi. A conventional supercritical unit operates at a steam pressure of 3500 psi or higher and steam temperatures of 1000 –1050F. By contrast, a subcritical unit operates below the critical pressure, typically 2400 psi at similar temperatures. The point of this is to save on coal to heat the water and reduce CO2 emissions. The gain in turbine efficiency is such that the added energy to reach higher temperatures can be recovered; at least in part so that the emissions can be reduced without hopefully, driving electricity rates out of sight. The difference lies in using pressure. We are familiar with the conventional sub-critical steam generation unit, the system operating at pressures that convert water to steam through the process of boiling. Now at supercritical pressures, water is heated to produce steam through a gradual expansion without boiling. Due to improved thermodynamics of expanding higher pressure and temperature steam through the turbine, a supercritical steam-generating unit is more efficient than a sub-critical unit. Efficiencies get up to the 39 percent range. USC technology means that electricity can be produced using less fuel. Because less coal is consumed, emissions of sulfur dioxide (SO2), nitrogen oxide (NOx), mercury (Hg), carbon dioxide (CO2) and particulate and solid waste byproducts are reduced. And USC technology is compatible with all types of coal. Early supercritical units initially operated at ultra supercritical levels. However, due to the unavailability of metals that could tolerate these high temperatures for extended periods of time, operation at these levels could not be sustained. Now power plants can be built using the recently developed chrome and nickel-based super alloys in components of the steam generator, turbine and piping systems that are exposed to the higher temperatures. The new metals can perform under these prolonged operating conditions, rendering USC no longer a goal, but practical design basis. Southwestern Electric uses this example to pitch their new USC plant: a 600 megawatt USC unit burning a typical Powder River Basin coal would consume 2.0 million fewer tons of coal over its lifetime than a comparably sized supercritical unit at steam temperatures of 1000°F. Again comparing these same two units, a three percent improvement in the heat rate (a measure of the fuel consumed to produce a unit of electric energy) would reduce CO2 emissions by nearly 4 million tons over a 30-year period. While USC is not a big percentage saving, the influence from environmental desires to reduce CO2 makes for changed economics. The added expense is sure to get to ratepayers, but it looks as though the costs are not nearly as scary as some ideas on carbon trading and other schemes to get carbon out of energy systems would be. In any case that 39% efficiency rating is a great advantage both in raw power production and downstream use such as charging electric vehicles. On the emissions front USC offers as good or better performance on the emissions that matter like particulates, metals as in mercury, volatile organics, and sulfur. Over time a continuous upgrade in coal burners may be transitional to more biomass as a fuel. With the heating units and turbine sets already in place the biomass fuel market could get big quickly if the genetics and production costs get competitive with coal. We’ll be looking into that, later. Ultra supercritical is worth knowing and understanding. It’s sure to be around until some form of fusion takes off in a big way. AEP's Turk is one of the most efficient, least polluting coal-fired power plants on the planet. Firsts are rare-by definition they come only once-and lasts are rare for the same reason. But rarest of all is that which is the first and last of its kind, like Doctor Frankenstein's hero-monster, doomed to be forever alone on the day it was born. AEP's ultra-supercritical coal-fired Turk power plant may prove to be one such rarity: a great technological leap forward unlikely to ever be repeated again in the United States. The Turk project was announced in August 2006 but didn't go online until seven years later. AEP spent those intervening years securing the necessary regulatory permits and fighting a battle in the Arkansas Supreme Court. AEP ultimately lost that battle, requiring a late-in-the-game reconfiguration of where all the plant's power output would be sold, but bringing a new coal plant online in the late 2000s was never going to be easy. "I would think there was always some concern," said Tim Riordan, vice president of engineering services for AEP, "because much of this was going to have to be decided in the court system or with commissions or other federal agencies and of course we don't have control over that." Still, it wasn't just a regulatory victory when the plant finally went into service on December 20, 2012. The event was also a technological victory: AEP had succeeded in bringing online the most efficient coal-fired commercial power plant ever built. The 600 MW Turk Power Plant is situated in Hempstead County, in the southwestern corner of Arkansas, where it employs 109 people on a total payroll of $9 million and pumps $6 million in school and county property tax revenues every year, according to AEP. Through its subsidiary the Southwestern Electric Power Co., or SWEPCO, which operates the facility, AEP invested $1.3 billion of the $1.8 billion required to build the plant and the company now owns 73 percent of its output. The remaining ownership is divided between the Arkansas Electric Cooperative Corp., the East Texas Electric Cooperative, and the Oklahoma Municipal Power Authority. The attribute that makes Turk unique among power plants-that gives cause to append the word "ultra" to the preexisting and more familiar "supercritical"-is that it works just like a supercritical power plant, only better. As an ultra-supercritical coal-fired power plant, Turk operates at extraordinarily high pressures and temperatures, well above typical supercritical pressures of around 4,500 psi and hotter than 1050 degrees Fahrenheit. "As you increase temperature you increase your efficiencies," Riordan explained. By working at such a high temperature and pressure, Turk achieves the highest efficiencies around in coal power generation today; according to AEP, between 39 and 40 percent of the thermal energy available in the fuel comes out as electric power. This level of efficiency in extracting energy from coal allows Turk to use less of the stuff to produce the same amount of power. Less coal burned means less emissions of sulfur dioxide, nitrogen oxide, mercury, carbon dioxide and particulate matter. It also means fewer waste products and less fly ash, and decreased need for the commodities used in environmental control activities, like activated carbon and ammonia. The reduction in pollutants is combined with the latest emission-control technologies, like catalytic reduction systems, dry flue gas desulfurization, baghouse technology to combat particulate releases and activated carbon injection to reduce Hg emissions. The end result is one of the most efficient, least polluting coal-fired power plants on the planet. Joey White, machinist, works to move some of the Turk Plant's emissions control equipment into place. Achieving super-high temperatures and pressures wasn't as easy as just dialing up the heat. Special materials had to be tested to withstand the pressure and temperature of an ultra-supercritical power plant. For use in the facility materials need to have high creep rupture strength, resistance against embrittlement, and low oxidation growth in addition to ease of manufacture and availability. "High chrome, creep strength enhanced ferritic steels (CSEF), and nickel based alloys meet these needs," Riordan said. Working with both the original equipment manufacturers and with EPRI (the Electric Power Research Institute), and other research groups, AEP worked "to understand these components"-like boiler headers, main steam lines, and blade components-"for their weldability and long term creep strength," Riordan said. "There was quite a bit of R&D work." In constructing Turk, AEP bought the major components, like the boiler turbine and environmental control equipment, before its EPC agreement with Shaw was completed. Afterwards, however, Shaw led construction on everything but the boiler, in addition to completing engineering details and integration of the facility. The boiler, along with the baghouse, dry scrubber, and selective catalytic reduction unit, were all provided by Babcock & Wilcox, while Alstom provided the main turbine and generator in addition to the feed pump turbine. In designing and constructing Turk, AEP included input from operating staff to ensure the innovative facility didn't just make sense from an economic and regulatory perspective, but from an ergonomical perspective too. Design plans gave consideration to something as simple as making sure thaTheadroom was sufficient to safely remove motors or maintain equipment. "Many times with an EPC contract the footprints get smaller and smaller because of cost concerns," Riordan said. "We spent a lot of time with our engineer of record, Shaw, to make sure that we had a very safe and maintainable facility. "You really don't want people standing on hand rails to operate a valve, right?" As to whether or not there will ever be another American plant like Turk, Riordan isn't optimistic. "I would hope so. Unfortunately with the new environmental rules for new generating facilities, the proposed CO2 limits are probably going to prevent that from happening in the near term," he said. "This could very well be one of the last conventional coal burning facilities built in the country." In my opinion all followers of abiotic theory should unite at one stage and only solution to be recognized. and i highly suggest to reconcile the strong evidences of current biotic theory also. infect we required a new balanced theory that can reconcile the strong evidences of both. any followers of abiotic theory can send me mail so that I can unite all. After generations of state control, Mexico’s vast oil and gas reserves will soon open for business to the international market. In December 2013, Mexico’s Congress voted to break up the longstanding monopoly held by the state-owned oil giant Petroleos Mexicanos — commonly called Pemex — and to open the nation’s oil and gas reserves to foreign companies. The constitutional reforms appear likely to kickstart a historic hydraulic fracturing (“fracking”) and deepwater offshore oil and gas drilling bonanza off the Gulf of Mexico. “This reform marks a major breakthrough in Mexico’s economic history only comparable to the signing of the North America Free Trade Agreement (NAFTA) in 1992,” international investing and banking giant Banco Bilbao Vizcaya Argentaria (BBVA) wrote in a January 2014 economic analysis. Contrast that to Texas, just across the border. There, production increased by more than 150 percent during those same ten years, according to Daniel Yergin. Texas’s gains are tied primarily to fracking, which has allowed drilling companies to tap into the Eagle Ford Shale and Barnett Shale basins. If the reforms bring about the production spike hoped for by Pemex and Mexican officials, the country could be among the world’s oil-producing giants by 2025. Mexico’s Reserves: Where and How Big? Mexico sits on nearly 14 billion barrels of oil in proven reserves, according to Pemex. The Oil and Gas Journal pegged it at 10.2 billion barrels at the end of 2011. But that’s just what they know they have. The country’s unexplored oil reserve potential is second only to the Arctic Circle, according to Bloomberg and others reporting on the reforms. Pemex estimates, as reported by Bloomberg, that deep-water Gulf of Mexico prospects could be as large as 26.6 billion barrels of oil. Onshore, there are potentially 60 billion barrels yet untapped. Though Pemex has rented four deepwater rigs to dig exploratory wells, experts believe that any real deep-water production will be contracted to foreign companies, which have the technical know-how to produce oil from these fields. The bill lifts the floodgates for industry to tap into more than 1.6 million acres of offshore oil and gas. Texas’s famous Eagle Ford Shale formation has been an epicenter of the U.S.shale boom, with accompanying health and air impacts to boot. Fossil fuel reserves don’t adhere to international demarcations, and just south of the border sits Mexico’s Burgos Basin (which Mexico calls the Boquillas formation). 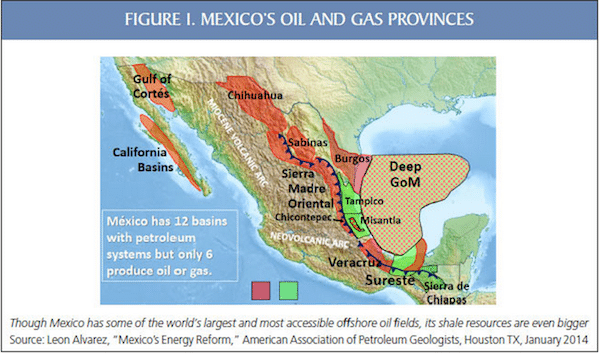 Pemex estimates there could be more than 300 trillion cubic feet of recoverable shale gas in the Burgos. And the U.S. Congressional Research Service pointed out in a January 2014 report that Mexico may have the fifth largest tight oil reserves and fourth largest tight gas reserves in the world. This is largely due to the portion of the Eagle Ford formation that stretches south of the border.